28 Sep 07:The ACT Policing annual report for 2006-7 shows the force improved its performance in some areas during the year, but continues to fail in others. As well, ACT Policing still refuses to operate formally under Public Interest Disclosure laws, Territory environmental/greenhouse rules and regulations, and the ACT Human Rights Act. At first blush this has been a good year for ACT Policing and the community. The Annual Report 2006-2007 reveals a drop in offences in a number of areas or rates of offences within the community that are, in many cases, under the national average. Admittedly, these improvements came at an additional financial cost to the community (some $7m in 2006-07). But, in the areas of some performance measures, governance and community perceptions, ACT Policing is under performing. The Auditor General’s certificate on the audit of the performance measures continues to qualify the opinions given by stating that ‘… expressed on the relevance or appropriateness of the reported measures for evaluating the effectiveness of ACT Policing…’ Of significance is the absence of any validation that the Annual Report is under pinned by performance measures that measure appropriately the effectiveness and efficiency of ACT Policing. Many performance measures continue to be “by comparison with the national average (for police forces)”. But the ACT has the smallest area, best roads, newest cars, most well-off and best-educated community, few areas of widespread disadvantage. These differences should indicate that the ACT Policing be substantially (10-15 percentage points) better than the national average of other police forces, who have all the territory of WA or Queensland, for example, to cover? As the Purchase Agreement for Policing Services to the ACT is the basis of reporting performance, it would be appropriate to have an independent performance evaluation undertaken on the performance measures to ensure how its police best serves the ACT community. The Annual Report notes that the number of ambulance attendances at heroin related overdoses has increased to 58% of the target, up from 42% last year. This is a measure of the success, or otherwise, of the Minister’s stated priority on reducing illicit drug use in the community. Not only has the measure shown an adverse increase, but the new policing agreement for 2007-08 removes the target for this important reporting of the success of a key ministerial priority; 2007-08 is a ‘benchmark’ year without target. Similarly, complaints issued relating to persons in custody is also a ‘bench mark’ year for reporting. There were no reported substantiated complaints issues relating to persons injured in custody in 2006-07, but ACT Policing have reported elsewhere that a member was charged with assault occasioning actual bodily harm for an occurrence in October 2006 at the City Watch House. Obviously, the police and auditor overlooked this serious event that resulted in the Ombudsman conducting a review of watch house procedures. Both these performance criteria should have measures, even while being re-evaluated, otherwise any performance outcome is acceptable. In December 2006, the handling process of complaints about ACT Policing were changed with the ACT Ombudsman now not involved in the resolution of all complaints, and is not advised of all complaints received. The Ombudsman has an ‘’enhanced oversight and inspection role” while complaint handling is primarily the responsibility of the ACT Policing Complaint Management Team. The Ombudsman notes that complaints statistics are not comparable due to the removal of mandatory referral of complaints to the Ombudsman. While the Ombudsman notes that there has been a 17% increase in complaints made to the Ombudsman under the Complaints Act to 413. The Annual Report shows a significant reduction in complaints against police (down from by 969 to 375) but no analysis is provided as to why this reduction occurred, nor is the discrepancy in the complaints reported between the two agencies explained. Significantly, there has been no change in the performance measures to reflect the management and reporting of complaints against police, nor is there any analysis or reporting of such complaints in the Annual Report. The Annual Report reveals that generally, total offences are down and the clear up rate are increasing. However, the number of assaults where actual bodily harm has occurred has increased by 17.3% and the clear up rate fallen in this category. Of concern is a 30% increase in incidents reported to police, 84,514 in 2006-7. No analysis or explanation is provided for this substantial increase of reported incidents within the community, other than it appears to relate to a 65% increase in priority four incidents (police attendance not time critical). As noted earlier, there is no reporting or analysis of complaints against ACT Policing following changes to the role of the Ombudsman. ACT Policing investigate the majority of complaints made against it. The lack of performance measures and reporting is a significant oversight in the accountability of ACT Policing to the community and undermines its stated values of integrity and accountability. The Annual Report declines to report under the ACT Public Interest Disclosure legislation on the basis it is a Commonwealth agency and that due to the nature of its business it does not need to report. Broadly, the legislation requires a report to the ACT Legislative Assembly of wrong doing , criminal or disciplinary offence by officials or agencies. It requires transparency, accountability and integrity of its agencies and officials, values shared by ACT Policing. The ACT has senior counsel advice that the Territory can make laws relating to agencies, such as ACT Policing, while performing functions within the Territory, hence the Public Interest Disclosure Act should apply to ACT Policing. In the interest of good governance, ACT Policing should set a community example by reporting under the legislation the performance of its officers. 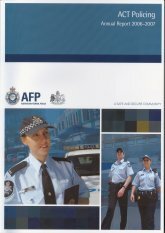 The ACT Policing Annual Report provides little information on the experience levels of the force, other than to indicate that 76 new members were enlisted during the year. It has been determined that in comparison to NSW, the ACT has a significantly inexperienced force with only 40% of its members with more than 5 years policing experience in 2005-06 (64% in NSW). There is no indication that the situation has improved.Of significance is the overall drop in policing numbers from 2005-06. The average number of sworn/unsworn officers between 2006-07 and 2005-06 is 829.3 compared to 842.23, an overall reduction of 13, 12 of whom were sworn officers. At the same time the financial statement indicates that the recreation leave costs have increased by 64%, a significantly variation. Absence on recreation leave, together with a 37% fall in overtime could signify a reduced level of availability of officers actually on ‘duty’ during the year. Overall, the report would indicate a fall in policing availability has produced an improvement in performance. Accordingly, it could be anticipated that the current strategies being pursued by ACT Policing will produced a marked improvement in policing outcomes in 2007-08, given that there is a planned increase in manning numbers of 37 (+5%) to 866 employees in 2007-08. The cost of policing increased by $7m (7%) in 2006-07 and will increase by some further $9m (8%) in 2007-08 on a comparable basis. After taking account of the manning projection planned for 2007-08, on a comparable basis there would appear to be an unexplained $4m real increase in policing costs in 2007-08.